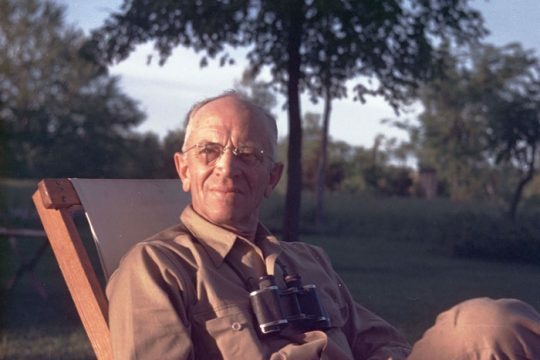 Aldo Leopold began keeping journals that documented his observations of natural events while he was a schoolboy growing up in Iowa, and he continued keeping track of nature until the day he died in 1948. His journal entries that spanned half a century reveal a life-long passion for phenology, the study of the timing of seasonal events in nature. Young Aldo was encouraged by his mother, Clara, to keep a journal and inspired by his father, Carl, to love the out of doors. His parental influences came together at a time in his life when he was also being exposed to a popular Progressive Era program for school-age children championed by the Nature Study Movement. A prototype of modern-day environmental education, the movement aimed to instill an appreciation of nature among children through direct contact with the natural world. Nature study was introduced through a series of pamphlets and books which required students to record their observations. One of the popular activities was phenology, which encouraged students to note the seasonal changes in the plant and animal life in their area. Phenology typically involves recording the first occurrence for the year of some natural phenomenon, such as the first blooming of a plant or the first sighting of a migratory bird. Aldo Leopold caught the phenology “bug” early. He dutifully recorded the first dates on which he observed various natural phenomena. His childhood journals are a testament to his newfound passion. Nature study introduced Aldo to scientific observations of nature as a way of understanding how the world works, but it also helped instill in him an emotional connection with nature. Thus, nature study promoted in young Aldo both scientific thinking and ethical values that were requisites of progressive citizenship. Journals from Aldo Leopold’s youth (1903 on the left and 1899 on the right) list dates and species observed. The connection between two phenological events (a plant blooming and a migratory bird arriving) revealed to Leopold an ecological relationship. He understood that the early arriving phoebe, a flycatcher that feeds on flying insects, was able to forage near the skunk cabbage when few insects were available elsewhere. Skunk cabbage, which attracts insects with its odor and ability to produce heat, had provided an essential resource for a newly arrived phoebe, perhaps having saved the early phoebe from starving during a cold snap when flying insects became scarce. His new insight into the interconnectedness of living things was only made possible because of Aldo’s passion for discovering and recording seasonal events. During Leopold’s 1909-24 time with the U.S. Forest Service in the Southwest, his personal journals and letters became less focused on simply listing things he’d seen and more on describing his times in the field. Still, those accounts often included lists of the species that he had detected. But, in a significant shift, his professional journals for the first time became repositories of data. His official Forest Service logs recorded observations on the status of the landscape because he knew he was going to refer back to them when making formal assessments of the National Forests. Journal entries were now about helping Leopold to understand what he was seeing in the field. Leopold and his family moved to Wisconsin in 1924 and purchased the “Shack” in 1935. His “Shack journals” featured his most systematic and comprehensive phenology observations. He and his family monitored hundreds of natural phenomena around the Shack, and Aldo meticulously recorded the observations in his journals. Aldo Leopold sits on a bench near the Shack recording notes in one of his journals. His dog, Flick, rests nearby. After a decade of collecting observations, Leopold decided to go back through his journals and attempt to find the “order and meaning in these events.” In a pre-computer age, this was an enormous undertaking that required examining thousands of observations and figuring out which represented the first observation in each year from 1935 to 1945. Leopold made tiny check marks over some of the journal entries to indicate those events were the first recorded for the year. The decade’s worth of events was tediously entered into a series of graphs as data points from which Leopold tried to decipher patterns. One of the patterns was clear: Some, but not all, of the plants and animals showed a response to the climate in a given year. Wisconsin’s climate being notably variable between years, warm years resulted in some of the recorded events happening earlier than in cool years. And, in 1947 Aldo successfully published his findings in Ecological Monographs, the premier publication of the 30-year-old Ecological Society of America, despite the scientific community’s lack of recognition of phenology as a serious natural science. A page from Aldo Leopold’s 1940 Shack journal. Note the check marks above some of the entries indicating it was the first observation of the year. Just a year later, Leopold died of a heart attack while fighting a brush fire on a neighboring property. The keeping of phenological records at the Shack came to a halt – at least for a time. In 1976, Leopold’s eldest daughter, Nina Leopold Bradley, and her husband Charlie returned to the area and built a home near the Shack. She resumed the record keeping until her death in 2011, and today, the staff of the Aldo Leopold Foundation continues the monitoring. The long history of data has allowed for comparative analysis linking phenological shifts to climate change. Leopold continues to inspire the field of phenology. He holds a special place in the pantheon of phenologists because he wrote so eloquently about the annual cycles of nature in the first half of A Sand County Almanac. Many readers have been introduced to phenology, without even knowing it, by reading Leopold’s engaging essays about the iconic events at the Shack during each month of the year. This article was adapted for length from “Keeping Track of Nature’s Almanac” which appeared in the Fall 2017 issue of The Leopold Outlook. Become a member and get it delivered to your inbox. Join today! Anyone can study phenology! Get the 2018 Wildlife Phenology Calendar for hints and reminders of what to look for in your backyard! A University of Wisconsin emeritus professor and senior fellow with the Leopold Foundation, Stan Temple held for 32 years the professorship once held by Aldo Leopold. Stan writes and speaks frequently about Leopold, wildlife ecology, and conservation. Contact him at ude.c1555993464siw@e1555993464lpmet1555993464as1555993464.